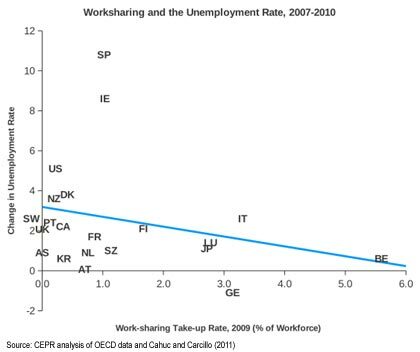 Update (February 15, 2011): Work-sharing is becoming more common across the OECD. The general pattern still appears to hold, those countries have pushed it most aggressively have seen the smallest increases in unemployment. The graph below has been updated. The April jobs numbers showed the unemployment rate rising back to 9.9 percent. While the main reason was that more people were looking for jobs (rather than more people losing jobs), on the current path, the unemployment rate will not fall to normal levels any time soon. There are two ways to fix this situation. The first one is to expand the size of the economy. This could be done by running larger budget deficits, through more expansionary monetary policy at the Fed, or by pushing the dollar down to increase our net exports. In principle, all three of these can be effective routes to boosting the economy and expanding employment, however as practical matter, none of these paths look very plausible politically any time soon. If we can't reduce unemployment by increasing demand, then we can try the second route to full employment: share the work. The basic concept is simple, if we can't get generate more jobs, then we can share the jobs we have by everyone working fewer hours. This is "workshare" system is already in place in several other wealthy countries, most notably the Netherlands and Germany. In Germany, the standard practice is that employers reduce work time by 20 percent. The government then makes up 60 percent of the lost wage or 12 percent of the total age. It requires the employer to make up another 20 percent of the lost wages or 4 percent of the total wage. The worker then absorbs a paycut of 4 percent in exchange for working 20 percent fewer hours. This might mean a 4-day week instead of a 5-day week. In these circumstances, the reduction in transportation costs and other work-related expenses can easily exceed the lost pay. Even though its loss in GDP has been larger than the decline in the United States, the Netherlands has seen almost no rise in unemployment in this downturn. Germany has actually seen its unemployment rate go down. On average, the rise in the unemployment rate has been less than 1 percentage point for the 8 countries that the International Labor Organization reports as having some form of worksharing program in place. By contrast, for the other wealthy countries, the average increase has been close to 3 percentage points.